Over the last thousand years the Cerrillos Hills, with its tricultural history, have held an unusually important place in the history of the American Southwest. The Cerrillos Hills turquoise and lead deposits played a central role in the commerce and economy of the prehistoric Indians of the greater Rio Grande Valley, and it is probable that these mineral deposits influenced the early Spanish explorations and settlement of New Mexico. The layers of lifeways in these hills, from pre-Columbian shrines, excavations and stone tools to Spanish-American and Anglo-American recreation, ranching, and commerce, give us our identity, define our cultural character, and constitute our heritage. To see and touch the mines that were dug by prospectors a hundred years ago, the stumps of the trees they cut for firewood and shoring, and the sites of their tents and the walls of their shelters is far more meaningful and memorable than simply reading about it in a book. The Cerrillos Hills State Park brings us into real contact with our real history. 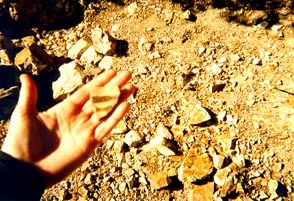 Pottery sherds found in the Cerrillos Hills date the use of the mineral resources from about AD 900, and the Hills are the source of much of the lead that was used for glaze paint by Rio Grande Pueblo potters between AD 1300 and 1700. Analysis of the sherds in the Cerrillos Hills indicated a large portion of them came from the nearby San Marcos Pueblo, which between the middle 1300s and the middle 1400s was the major center of pottery-making in the upper Middle Rio Grande Valley. Archaeological sites present today and associated with the Puebloan mining activities in the Hills include turquoise pits, quarries, lead or galena mines, refining areas, workshops, hearths, campsites, and sherd areas. The Mina del Tiro, on private property adjacent to the CHSP lands, is perhaps one of the most ancient and longest-worked galena lode mines in the New World. There are numerous sites on the Park lands that are registered with the Museum of New Mexico's Laboratory of Anthropology, including three prehistoric stone rings and a petroglyph at the summit of Grand Central Mountain.